Harmless sounding, but if you are an Ontarian capable of being embarrassed, here's a short review of the history that should embarrass you. Right now, most customers don't get a break on their bill if they use energy during off-peak hours when demand is lower. In particular, those off-peak hours range from about 10 o'clock in the evening until 7 o'clock in the morning. The reason they're not getting a break is because old-fashioned energy meters only record how much energy is being used and not when it is being used. Smart meters, together with more flexible pricing, would allow Ontarians to save money if they run appliances in off-peak hours. That's why we are directing the Ontario Energy Board to develop a plan to install smart electricity meters in 800,000 Ontario homes by 2007 and in each and every Ontario home by 2010. Today most electricity consumers have a smart meter, and most are now on "time-of-use" pricing. Prior to the last election, off-peak hours were moved back to 7 pm, so as to exclude the highest demand hours of the day. To ensure the widest range of technological choices, entities investing in Ontario’s electricity system and those developing home energy management systems should continue to work with standards organizations, such as IEC, IEEE, Zigbee and Home Plug, to develop and promote open communications standards. Open standards and the world's most powerful developers. A promising future for consumer control... but utilities were laying the groundwork to prevent that. Smart technology refers to components that can communicate, the communication protocols and networks, the servers, the software, the security protocols, the network architecture controlling access. Our governments seem to lack the technical expertise in information technology and the bureaucratic backbone to face down poor direction. This was bad - the LDC (local distribution companies) needn't have been involved. Throughout the world utilities had held the line on owning the data from the meters, and Ontario was no different. In 2008 the "Meter Data Management and Repository (MDM/R)" became operational, and "only LDCs and their authorized agents have the ability to transmit or request information from the MDM/R." 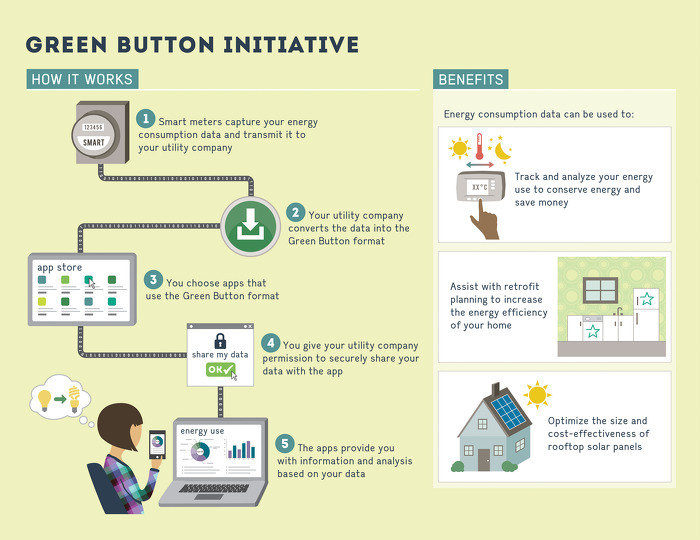 The White House, in September, "challenged the smart grid ecosystem to deliver on the vision of Green Button and provide customers access to their energy usage information electronically. With this information at their fingertips, consumers would be enabled to make more informed decisions about their energy use and, when coupled with opportunities to take action, empowered to actively manage their energy use." The traditional utility controls the data - in Ontario the MDM/R prevents real-time access by customers to the data of customers. November sees Ontario's Minister of Energy announce a working group to copy the U.S. program, or as the news release put it, "explore an Ontario Green Button initiative that would use innovative smart grid technology." ... I've gone from curious about the green button data to curious about why the site is so slow and unstable. From the frequent bot protection pop-ups, it appears offering no functionality is a security feature. Within a week Hydro One responded:, "In order to provide you with an accurate response, please provide your property address, meter number and/or Hydro One account number..."
Once I had the green button data, I looked to apps to use it with; there's a long list of U.S. apps at openei.org, but the only one I found that would accept my data lead to a primitive display of Mike Tyson boxing for some reason (apparently I was fighting another household - and I did win, but that's all the information I got from the app). Not that the time was wasted: I now get coupons e-mail'd to the address from which I sent the inquiry to Hydro One. September brought the latest publication from the Ontario Smart Grid Forum; Ontario Smart Grid Progress Assessment: A Vignette. aside: I wonder how much money was spent on consultants in order to arrive at the decision to move from "Reports" to "Vignettes"? It isn't clear they understand the answer is essentially 0 - and that the lack of real-time functionality is the reason applications can't be valuable. A search for the term "value" in the vignette returned 9 instances, none of which are attached to any claim of having provided it. While the report is nominally about smart grids, it is useful primarily in demonstrating Parkinson's law; Parkinson wrote on the growth of Britain's Colonial Office during the decline of the Empire, and the smart grid forum reports (vignettes?) on the growth of bureaucracy and utility expense during the decline of electricity consumption. The announcement to replicate, in Ontario, the U.S. app contest from 18 months earlier. The contest isn't expensive by government terms - just $50,000 (I invite all with the capability to copy the apps at openei.org - points may be deducted for originality). It is expensive due to the partnerships required to acquire the brainpower to copy an ineffectual U.S. program; the announcement was made at Ryerson (been there - during one of its previous world leading innovation periods when it contained the Eaton's School of Retailing), jointly with MaRS (not the planet, devoid of intelligent life). It can't help the image of Ontario's actual technology industries to have a government that has spent billions on "smart" things only to stupidly copy a U.S. contest in the hopes somebody might present something intelligent.